A Christmas Carol (2009) | Anime etc. It’s common wisdom among animators that humans are the hardest species to simulate realistically, because we know the true articles so well. Director Robert Zemeckis takes up the challenge using the same CGI techniques as The Polar Express (2004) and Beowulf (2007), trying to capture not just the movements and expressions of real actors, but their very living presences. These “motion-captured” figures are the children of Gollum in The Lord of the Rings, not the stumpily caricatured Carl Fredrickson in Up, despite Zemeckis’s and Pixar’s films both going out under Disney’s banner. 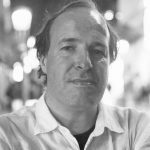 At the same time, Zemeckis takes up a parallel challenge in remaking Charles Dickens’s A Christmas Carol, which many viewers know inside-out through the original story and its innumerable retellings, reworkings and spoofs. Even Up, with its Scrooge-ishly redeemed elderly hero, was in Dickens’s shadow; it’s good to see so many senior citizens getting an animated work-out. Scrooge is supported by Zemeckis’s usual visual flair, starting with an exhilarating whirligig rooftop tour over Victorian London that very probably gains from the 3D format. Later, the terror of Scrooge’s ghostly encounter with Marley is conveyed with slow-building relish. Too much relish, perhaps, as this new version is sufficiently scary to frighten youngsters out of their wits. When the Marley-ghost’s lower jaw becomes detached, the moment is close to a zombie horror film. Two other bogies, the feral children Ignorance and Want (who are omitted from many versions of the story), are just as monstrous. As for the three Christmas spirits (also performed by Carrey), they’re suitably powerful, unearthly presences, but with little warmth or humour, despite the relentless mirth of a king-sized Ghost of Christmas Present in his shining flying throne room. The other humans are neglected technically and dramatically. The virtuous Cratchits are one-note, with more emphasis on their griefs than their joys; the one arresting new moment has a raw-eyed Bob Cratchit seeming to see the “invisible” Scrooge after Tiny Tim has died in Christmas Yet to Come. Scrooge’s lost love (performed by Robin Wright Penn) is treated perfunctorily, bottling the artistic challenge of conveying romantic passion in CGI. The climax descends into irrelevant action scenes designed for the trailer and IMAX release. The animators who did so well with the grasping, covetous old Scrooge are far less convincing with the reformed version. When Scrooge comes out in his merry new self to Bob Cratchit, he feels more sinister than joyous; you sympathise with Scrooge’s maid, who runs away screaming. Away from Scrooge’s sagging wrinkles, the supporting characters sport the usual array of inhumanly smooth skins, immobile faces, and other hallmarks of “Uncanny Valley,” as this kind of animation is called. Sometimes it’s hard to know if Zemeckis is making a joke out of the limitations. The undertakers who dispose of Marley in a shadowy opening scene could almost be the walking dead, and a dancing woman in Scrooge’s idealised memories becomes disconcertingly weightless. 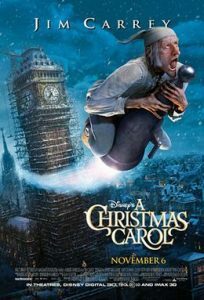 In one of the film’s increasingly repetitive rollercoaster spectacles, Scrooge rockets high into the heavens, only to come plunging down kicking and screaming. The film follows a similarly flawed trajectory; rather wonderful to start with, then sinking back towards heartless razzle-dazzle.